Seagate FreeAgent GoFlex Net media sharing device is actually another variant of Seagate FreeAgent DockStar, where both is based on Pogoplug service to allow users to share and access files stored on devices connected via USB or GoFlex (SATA) interface from anywhere, anytime through Internet and LAN. Share your photos, music, and movies over the Internet without uploading. Access your digital files from any computer on your home network, be it PC or Mac, and from anywhere in the world. Listen to your music, watch your movies and access your content or upload files from iPhone, iPad, Blackberry, Palm Pre or Android mobile devices with free mobile app. Creates a private virtual space for sharing files with friends and family. Friends and family can upload and download content on the shared space. One-click integration with favorite social media sites, including Facebook, Twitter and MySpace, by automatically sharing pictures and files. Ability to copy files between two drives on the same GoFlex Net. Streams content and media files onto a TV from a GoFlex TV or FreeAgent Theater+ HD media player. Ability to add more storage space to home network easily. Works seamlessly with GoFlex ultra–portable drives and any USB storage device. Easy to setup and activate. Can work as network attached storage (NAS) device through Samba (SMB) Windows file sharing or Pogoplug app for desktop access. GoFlex Net has a 4-bar LED indicators that indicates the space used on drives connected to each dock. Zero light-out bar means the drive is empty and one bar means the drive has 75% to 100% of free space, with each additional bar means reduction of up to 25% on capacity left. There is also a small amber and green LED indicator which used to indicate if the device manages to connect to Pogoplug service or either any drive is plugged in. 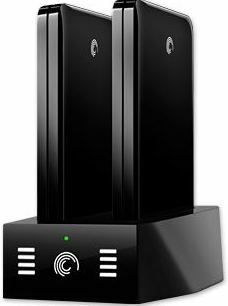 As can be seen from the GoFlex Net specifications, the device is designed specifically for GoFlex Storage System, and it accepts up to two (2) GoFlex ultra–portable drives via the integrated docking slots and another external portable hard disk mass storage device or USB flash drive via a single USB 2.0 port. The integrated docking slots is designed specifically to fit the GoFlex ultra-portable drive, with the interface adapter removed. The design reduces cluttering as there isn’t any cable to connect, but it essentially prevent other USB hard drive from been connected to GoFlex Net through the slot. 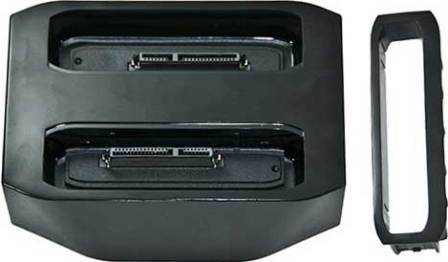 However, the slot has standard SATA connectors (not to be confused with USB, eSATA or FireWire as GoFlex Net slots effective eliminates the requirement of cable). So users can slide in a bare 2.5″ SATA hard disk drive with separate data and power connectors (without casing) into the slot, though it won’t fit nicely and looks awkward. A removable inserts allows a fatter 2.5″ drive with higher capacity been slotted in. Set up and start using GoFlex Net dock is very easy. Plug the unit to the power, and connect it via Ethernet to the router. For optimum performance, the GoFlex Net does not support wireless or WiFi connection to the router, which is the case for most NAS anyway. Then, just visit www.seagate.com/activatemygoflexnet, part of Pogoplug service, to create a new account or sign into an existing account to activate the device. Normally, the Pogoplug service can auto detect the serial number of the device, otherwise, just manually enter the serial number which found at the bottom of the GoFlex Net. Once the GoFlex Net is actually, the Pogoplug portal is where most actions and configurations takes place. The online portal allows user to upload files, share, access, view, delete, manage or download contents on the attached disks. A nifty feature is that it has built-in viewer for common file types so that local applications is not required to view common files.It’s also where all the settings and configurations on the GoFlex Net can be done, such as enabling Windows File Sharing (WFS) with read-only or read-write access choices, posting updates to social networks such as Twitter, Facebook and MySpace, enabling HTML5 audio and video, generating thumbnails, enabling SSH access, enabling email upload, and enabling print to GoFlex Net Pogoplug-enabled device. Though it looks like many options available, in actual configuration is easy and straight forward. GoFlex Net has built-in media streamer to stream audio and video to supported receivers such as FreeAgent Theater+ HD media player, GoFlex TV HD media player, XBox 360 and PS3, and can build custom slideshows. One particular annoyance is that whenever wants to detach a drive from the GoFlex Net, user has to go online to disconnect the drive on Pogoplug prior to pull out the cable, or else the drive may be unrecognized in future use, or worse, corrupted. Pogoplug also has no notification on whether there is anybody is accessing the drive when attempting to disconnect, which may cause data loss if the drive is suddenly detached while somebody is uploading files. In addition to the goflexnet.pogoplug.com, desktop program for Windows and Mac OS X is available which allows local direct copying or transferring, and to setup automatic file syncing. There is also a Pogoplug app available for iOS (iPhone, iPod touch and iPad), Android, Blackberry and Palm Pre (available from iTunes App Store, Android Market, Blackberry App World and Palm App Catalog respectively), which lets users browse and share your files and upload photos and videos directly from the mobile phone, essentially allow files been transferred from mobile phone to local area network wirelessly. The app works flawlessly, though more features can be added to make it more perfect. While FreeAgent GoFlex Net is supposedly easy to use, some people may still encounter some issues, especially slow transferring, especially uploading to the attached disk drives though Pogoplug service. Ability to transfer, copy, upload and download from GoFlex Net is the capability that makes GoFlex Net a cheap alternative Network Attached Storage (NAS) device. Some users have reported that transmitting speed from local computer to GoFlex Net is slow to crawling, even if the GoFlex Net is on the same local network as the computer, which commands user to spend some time to configure the firewall and/or router to solve the issue. Luckily, Windows File Sharing allows users to map network drives from GoFlex Net attached drives, and its transfer speed is not affected. As it’s not an dedicated NAS, understandably that the file transferring speed is lower on the same networking setup. On my setup, it’s possible to transfer files at around 10 MB/s through Ethernet cable, much slower at around 1 MB/s on Wireless G connection to the router. Pogoplug service is now free for lifetime, and so do for Seagate FreeAgent GoFlex Net, which makes it a good alternative to paid commercial file hosting, file sharing or file backup service that requires recurring payment, although it lacks the security of hosting on the remote cloud place. 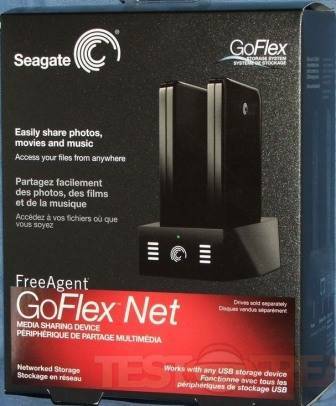 Seagate FreeAgent GoFlex Net Media Sharing Device is available at retail price of $99.99 at seagate.com, or you can look for better deals at Amazon (aff) or other stores where price drops to $79.99 or less. However, it’s device-only price without the hard disk drive. If you want to take advantage of the GoFlex slots, you will need to purchase GoFlex GoFlex ultra-portable drive separately, or else you can only attach a single USB storage drive via USB 2.0 port or has to strip the hard disk drive casing to connect the hard disk directly into the connectors of the GoFlex Net slots. In conclusion, the GoFlex Net is a great product that offers easy way to share files and access files online. It can works as an reasonably priced NAS too but it has less flexibility, unless you’re attracted to Seagate’s GoFlex storage systems and own couple of GoFlex ultra-portable hard disk drives. If the drives that you intend to connect has mostly non-GoFlex interface, it’s better to look for alternative which offers more generic USB ports, such as Seagate FreeAgent DockStar (aff). Disclusure: My Digital Life received a Seagate FreeAgent GoFlex Net Media Sharing Device for review.